Storyboarding and visualisation is a vital component for accurately addressing client briefings in a final video. AHTOH provides optional high quality pre-production and visualisation in-house on all projects from corporate video to action sports edits and commercials. With a background in illustration and design, AHTOH Director, Anton Nelson, can work up detailed sketches of locations, key scenes and camera movement as part of a commissioned project. These visualisation can be circulated in advance allowing approval from all stakeholders ahead of principal photography. 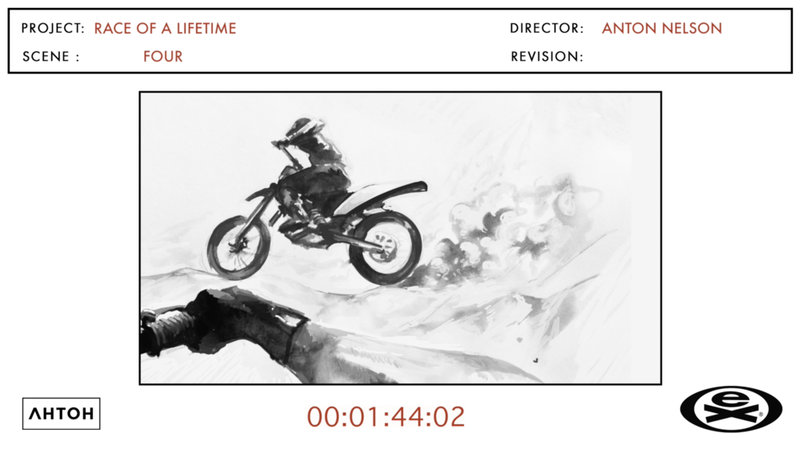 Initial storyboard concept for DCL / Dorna promotional social video for Redbull TV. Storyboards can also be delivered as ‘Animatics’ or animated storyboards, cut to music with timecode to provide further clarity to narrative pacing and execution ahead of filming. The example below shows perspective-structuring for a 360 video project, allowing the client to see a 2D outline of the short film as it may appear on a mobile device or computer screen. Visualisation and Storyboarding can prove a powerful cost saving activity for multi-stakeholder productions - AHTOH can provide this work as a standalone or as a full-wrap service including filming, editorial and finishing.